Magento Hide Price is the #1 and most powerful Magento extension for hiding product prices of Magento Community & Enterprise editions. 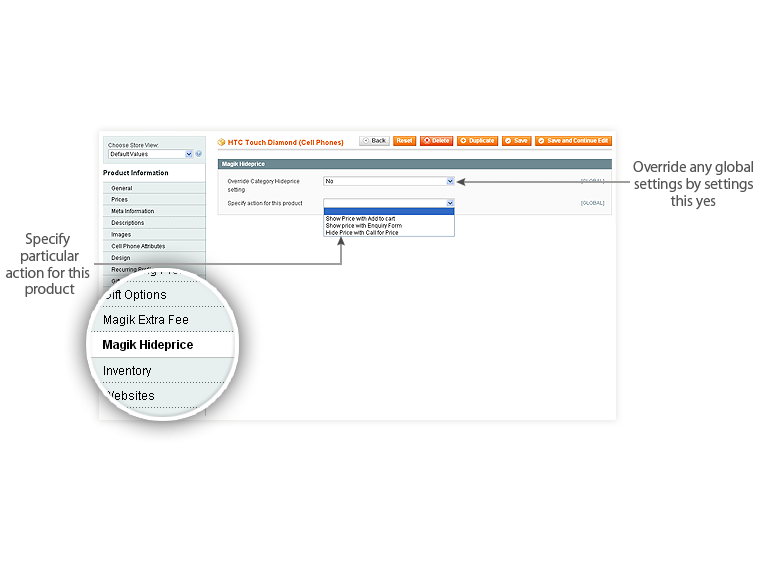 Magento hide price extension from Magik helps store owners to hide product price from guests, visitors and customers, as desired. It can easily switch between hiding product prices, hiding product prices for everyone instead show “Call for Price” or display prices but hide add to cart button instead show an inquiry form for customers to fill. Store owners can customize the messages, which they are willing to show to their customers. In our previous post we have covered what is hide price? So, if you are wondering why you need to hide the product prices in first place? that might help. 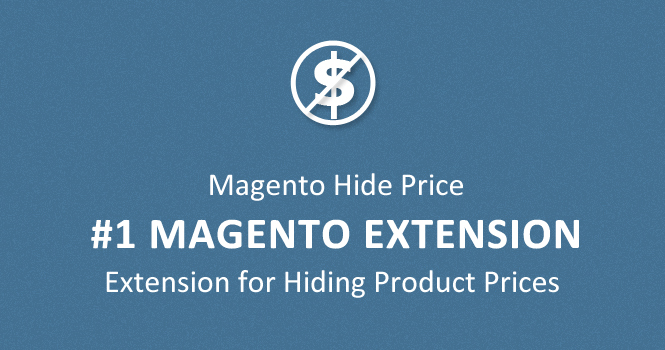 Magento hide price extension provides an excellent way of enabling/disabling mechanism. Suppose, for some reasons you want to disable the extension or first timers wants to enable the extension. All you have to do is go to Admin -> Configuration -> HidePrice Settings under General tab simply select “YES” to Enable Hideprice Module. Similary, select “NO” to disable the hide price extension. Finally hit the “Save” Button. 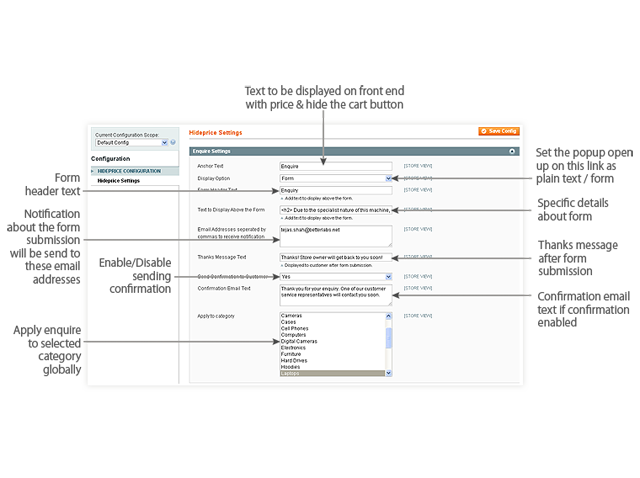 Magento Hide Price extension hides the product prices from casual visitors, not logged-in customers in an efficient way. You can easily configure the global settings by clicking on Admin -> Configuration -> HidePrice Settings under Hideprice Settings tab. This is where you can define global configuration settings for hiding product prices on your Magento store. Suppose, you want to hide the product prices for entire category all you have to do is to configure Hide Price global settings. To do this you have to fill the form only once. Here are the steps to configure Hide Price global settings. Add your message for the guests, visitors. This text field allows you to personalize the message you want to convey. Now, choose the appropriate categories (multi-select) on which hide price settings will automatically be applied. That’s it! All the products filed under the selected categories will not show the product prices anymore. 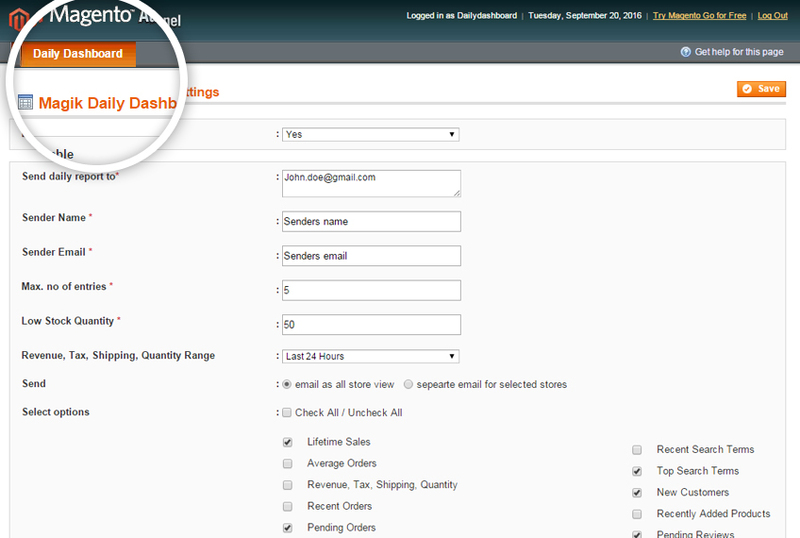 Magento hide price extension also empowers store owners to override the global settings for any individual products. To override the global hide price settings, edit the product you wish to apply something else. You will notice a tab called Magik Hideprice from here you can override the default category settings and choose which option should be applied on this particular product. Keep in mind that hide price will only hide the product prices from guests, visitors or not logged in customers. But all registered and logged in members will be shown the product prices all the time. Now, you don’t have to buy separate extension to achieve call for price functionality. Magento hide price extension is powerful enough to transform between hiding prices or showing call for price text or form. If you want to hide the product prices & add to cart button completely and display a form or text message this is what you should configure. 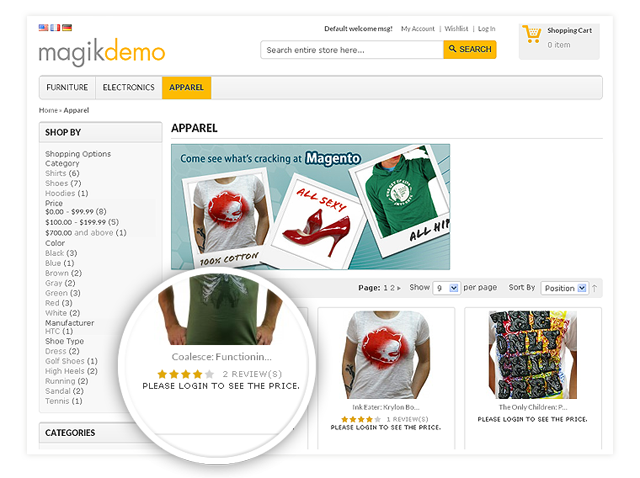 Let’s learn how to configure and use Call for Price on your Magento store. 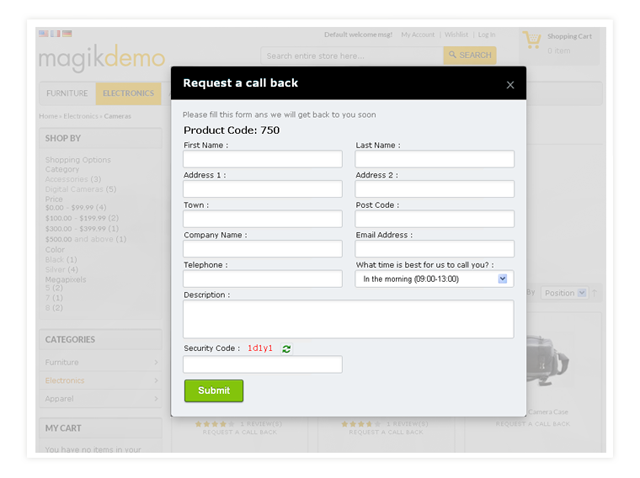 Call for Price as Form: You can configure call for price tab to display a form for your customers to fill. This is a great way for you to touch base with your customers. 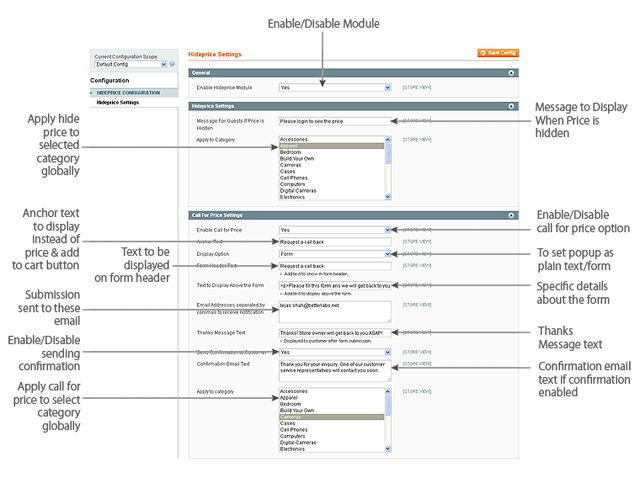 Just configure the way you want and it will display a form like shown below. Call for price as Text: The power of call for price is that you can show specific text to your customers as well. You can display a personalized message, contact information, email address or anything you like. Select the categories (multi-select) to associate Call for Price. That’s it! Now the selected categories will show the settings as configured by you. Overriding this is easy, edit the product you wish to apply something else. You will notice a tab called Magik Hideprice from here you can override the default category settings and choose which option should be applied on this particular product. Keep in mind that call for price will hide the product prices & add to cart button from customers regardless they are logged in or not. 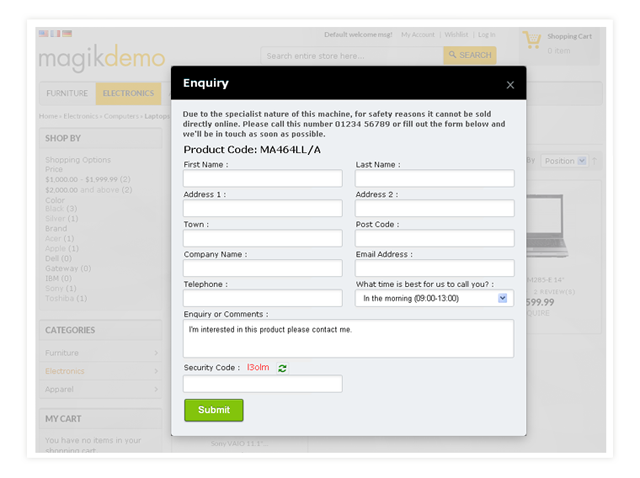 Set this up only if you want your customer to contact you to know the product prices. If you want to hide add to cart button only but show product prices then this is what you should configure. This option is perfect for some specific products which can not be sold directly for safety reasons. So prices of the products are shown but instead of add to cart button inquire link is shown to the customer. Customers can fill up the Inquire form & store administrator will receive an email and he will further contact the customer to proceed with the purchase process. It’s pretty obvious that for various scenarios you might need specific control over certain products. We have thought them well, you can easily switch between hide price, call for price or inquiry form for any individual product. To override settings for an individual product you have to edit the product. You will notice a tab called Magik Hideprice from here you can override the default category settings and choose which option should be applied on this particular product. I hope this Magento hide price tutorial will help you sell more efficiently. Please leave us a comment and share your ideas with us, let us know how we can improve the extensions? what additional functionalities do you expect.